Fibber McGee & Molly had a long and successful run on radio from 1935 to 1959, featuring its creators and stars, married couple Jim and Marian Jordan. Living in the fictional midwestern city of Wistful Vista, Fibber was an American teller of tall tales and a braggart, usually to the exasperation of his long-suffering wife, Molly, who tried to keep him out of trouble. Fibber’s weekly schemes would be interrupted by, inspired by, and often played upon the people of Wistful Vista, a set of regular players and characters that were as beloved as the stars of the program. Life in their town of Wistful Vista followed a well-developed formula but was always fresh. The show began as a comic reflection of Depression-era America, but as time went on and the shadows of war came over the nation, the show again caught the mood of the country. World War II was fought on the home front in Wistful Vista as surely as anywhere else in America, but here they had the benefit of Fibber’s somewhat addled perspective on life. 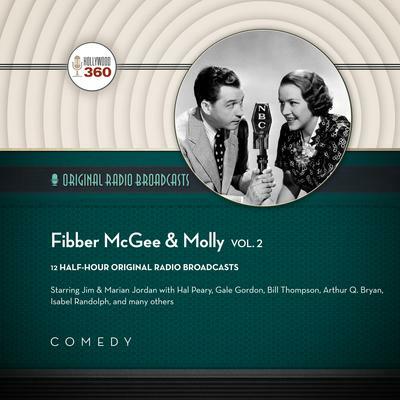 Fibber McGee & Molly had a long and successful run on radio from 1935 to 1959, featuring its creators and stars, married couple Jim and Marian Jordan. Living in the fictional midwestern city of Wistful Vista, Fibber was an American teller of tall tales and a braggart, usually to the exasperation of his long-suffering wife, Molly, who tried to keep him out of trouble. Fibber’s weekly schemes would be interrupted by, inspired by, and often played upon the people of Wistful Vista, a set of regular players and characters that were as beloved as the stars of the program. Life in their town of Wistful Vista followed a well-developed formula but was always fresh. The show began as a comic reflection of Depression-era America, but as time went on and the shadows of war came over the nation, the show again caught the mood of the country. World War II was fought on the home front in Wistful Vista as surely as anywhere else in America, but here they had the benefit of Fibber’s somewhat addled perspective on life.